In our performances we take turns with verbal explanations and musical examples. 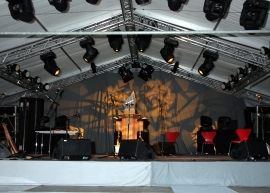 Therefore most of our concerts are given as conversation concerts. 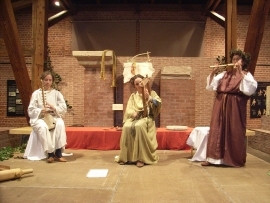 In order to bring the atmosphere of historical musical practice to life, we perform in correspondig historical clothing which we reconstruct according to iconographic sources, historical descriptions and archaeological textile finds. -"Of singing, jingling bones - music from the Stone Age"
-"Blaring sun, whispering moon - musical impressions of the Bronze Age"
- "Musica barbarica - sounds of the Germans and Celts"
-"Etruria et Celtica in tempore - a time travel to the celtic and etruscan cultures. 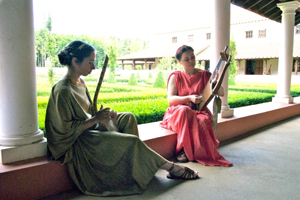 Who would not know the cliché of wine, women and song in ancient Rome? Nero playing the lyre, menads beating drums in rapture, or Pan with his flute - our imagination of Antiquity is full of music. We bring it to new life and, moreover, reveal the secrets behind these clichés: were there musical notes written? Was the lyre plucked or strummed? Did they really play double flutes? Did the legionaires march to the sound of drums? This and more you will listen to in our programs. -"Lyre, lute, horn and sword - early medieval music and instruments"
-"Heathen Christianity - songs and dances of the Slavians and Vikings"